"These delicately-spiced, rose-scented cookies are the perfect treat for Passover since they contain no flour. They are nutty and rich, slightly chewy with a crunchy exterior. Pistachios or almonds can be substituted for the walnuts." In a medium bowl, mix together the ground walnuts, 3 egg yolks, sugar, cardamom, baking soda and rose water until well blended. Roll teaspoon sized pieces of dough into balls and place onto parchment-lined baking sheets. Cookies should be spaced 2 inches apart. Whisk together the remaining egg yolk and water using a fork. 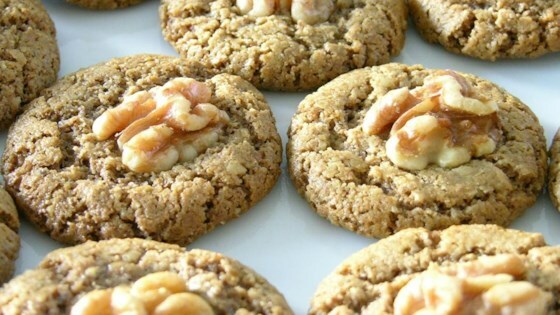 Press a walnut piece into each cookie, then brush with the egg yolk glaze. Bake for 20 minutes in the preheated oven, or until golden. The cookies will appear soft and undercooked but take heart, they will harden considerably when cooled. Allow them to cool on the baking sheets for at least 10 minutes before transferring to a wire rack to cool completely.